Driving after suspension or revocation is one of the most serious traffic tickets under Missouri law. This violation is a 12-point offense, which means that a one-year suspension can go into effect regardless of the length of the suspension you were on previously. Driving after suspension or revocation is also a criminal misdemeanor, which means that you can end up with a criminal record, a fine and the risk of jail time, which increases with subsequent offenses. If you face a long license suspension for driving after a suspension or revocation, get the legal advice you need. Contact the law firm of Law Office of Kenneth P. Carp, in Bridgeton MO to learn about your options for resolving, reducing or defeating the charges. With decades of traffic tickets defense experience in St. Louis and the surrounding counties, our lawyers know how law enforcement practices, charging policies and court procedures can vary from one municipality to another. Your alternatives for clearing up serious traffic charges will differ bases not only on the facts of the case but also on where you were stopped. In some localities, we will have the opportunity to look for compromise charges that can protect you from the prospect of a lengthy license suspension. We can even argue for a stay of imposition of the additional 12 points against your license. In other situations, however, we will need to focus on the development and presentation of a defense at trial. Our lawyers know how to find the weaknesses in a serious traffic violation case. Our courtroom skill has given our firm a reputation for success at trial that by itself can often serve as leverage toward a favorable outcome. Your best options for resolving a serious traffic case will depend on many factors, ranging from your previous Missouri driving record to the nature of the moving violations associated with the present offense. Our attorneys can advise you in specific terms about the way the facts of your case will affect your immediate and continuing interests. Put our experience to work for you before you pay a fine and accept a long license suspension. 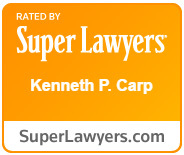 For a free consultation with attorneys who know how to defend charges of driving after suspension or revocation in St. Louis and the surrounding area, contact Law Office of Kenneth P. Carp in Bridgeton MO.